Sometimes you're in the mood for pizza, but want something a little different than the traditional pie. Luckily, the classic flavor combo lends itself well to a whole range of presentations. You can have pizza for breakfast, lunch, and dinner without once cracking open a takeout menu with these awesome recipes. If you can't decide between pizza and pasta, we've got you covered. Try this awesome spaghetti casserole with pizza flavors that stretches a single pound of ground beef to feed the whole crew. You can even make it ahead and refrigerate overnight before baking or freeze it for up to three months, for an easy make-ahead meal. These pizza pockets taste sort of like an inside-out pie, so you can enjoy them on the go. Wrap canned pre-made dough around tasty fillings like pepperoni, peppers, olives, and of course, gooey mozzarella cheese. Use either refrigerated pizza dough or biscuits for this delicious, kid-friendly recipe. This unique noodle dish with crispy crust and saucy interior will bring everyone running to the table. Parmesan, mozzarella, and ricotta all give it that signature cheesiness, and a little chopped spinach adds a hit of nutrition the kids won't even notice. Bake it in a springform pan for a pretty presentation, or a pie plate for equally good results. Bake up hearty pizza flavors in this bubbling casserole that makes enough to serve a crowd or bring to a potluck. Cook the pasta to just al dente before mixing it into the rest of the ingredients and baking. Leaving it a little underdone means it won't get mushy when baking. Mix up the ingredients to match your favorite pizza toppings, too! Roll up this spicy meat and cheese Stromboli that looks like a pizza roulade. Traditionally, Stromboli features deli meat and mozzarella, but you can add the vegetables, meats, cheeses, and herbs you like. It tastes great as a meal itself, but also works as part of an appetizer spread. Wrap flaky, tender empanada dough around mozzarella and cheddar cheeses, pepperoni, and pizza or marinara sauce to make a delicious snack, a light lunch, or starter. They look similar to calzones, but the dough has a different texture that really sets them apart. Make these on the smaller side and serve with a side of extra marinara for dipping, as a fun and different appetizer. Once a standard latchkey kid food, English muffin pizzas make a simple and filling snack, lunch, or breakfast even your middle schoolers can make. Top them with cheese and pepperoni or any of your favorite pizza toppings. Watch them carefully so the cheese melts but the muffins don't burn and proceed with caution—the cheese gets very hot. Enjoy pizza for breakfast with this omelet packed with pizza flavors. Instead of a crust, the cheese, pepperoni, and sauce nestle inside fluffy eggs for a lower-carb version that starts your day off right. Lighten things up by using turkey pepperoni instead of pork, if you're concerned about cholesterol. Crostini make a great way to start out a party and they're excellent addition to a snack spread. Best of all, you can toast the bread ahead of time and cook up the crostini as needed, for a relatively simple treat. Any of your favorite pizza toppings would work well in this recipe, so you can use the same method for a whole slew of preparations. The only limit to this gooey baked pepperoni pizza dip is your imagination! Start with cream cheese, pizza sauce, mozzarella cheese, pepperoni, and black olives and add diced bell peppers, sausage, bacon, additional cheese, or whatever you like best. It cooks up well in a pie plate or another shallow pan, and tastes great with tortilla chips, baguette, or crackers. This bubbly, cheese-packed dip brings all of your favorite pizza flavors to the party and you don't even have to pick up the phone. Baking pizza dough as dippers makes it even more of a deconstructed pie presentation. Add more cracked red pepper flakes if you like a spicier dip, or serve it with a little hot sauce on the side for guests to adjust their own. Whether watching the big game or hanging out with the family on a weekend afternoon, these pepperoni pizza sliders will go over big with the crew. They also make a fun group project, since little hands can help assemble the mini sandwiches. Buttery brioche rolls contrast beautifully with salty pepperoni and acidic sauce, but you can use any kind of small rolls you like. You can't necessarily eat a whole slice of pizza while standing at a get-together. Solve that problem with these adorable bite-sized pizza appetizers. Use mini phyllo cups or any small dough rounds, then top them with mozzarella cheese, chopped or miniature pepperoni, pizza sauce, and any other toppings that strike your fancy. 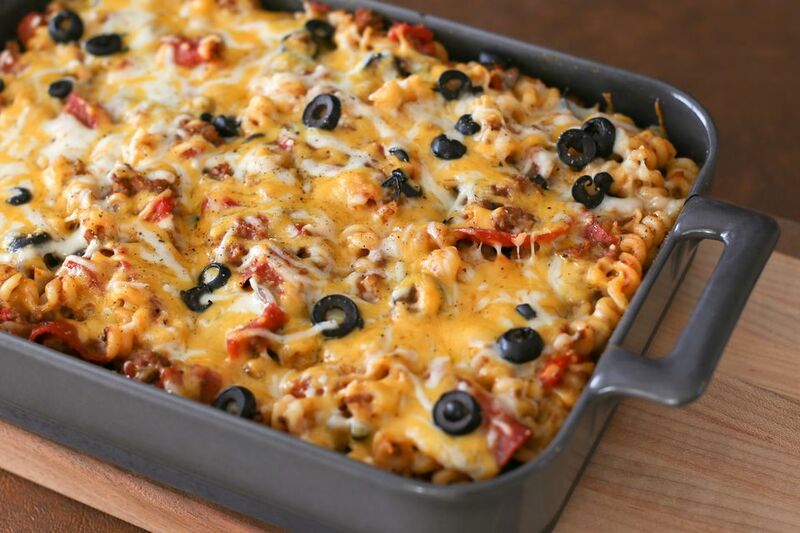 Crock Pot Pizza Pasta Casserole. 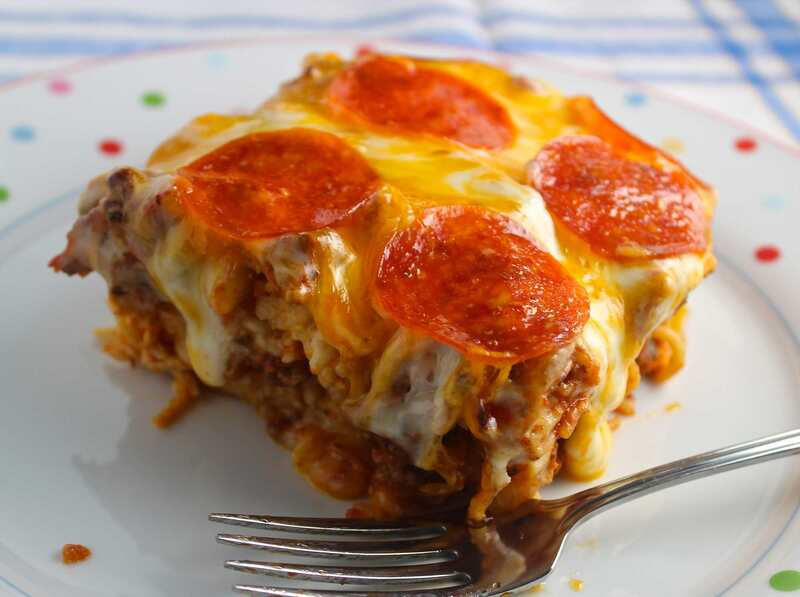 When you don't have a lot of time on your hands, reach for your slow cooker to make this delicious and filling pizza casserole. You can finish the dish right in the cooker to cut down on dishes, or transfer it to the oven for the final step. Either way, it will fill your home with delicious aromas that will have everyone swarming the kitchen by the time the dinner bell rings. Go all out with this French grilled cheese that comes topped with pizza ingredients and enjoy two of America's favorite foods at once. Cheesy, tomato-y, pepperoni-studded, and just greasy enough, this sandwich will cure what ails you if you need a little morning-after junk food. It may not make a great everyday meal but for a special treat, fire up your broiler and go to town. Grab a can of refrigerated crescent roll dough for these cute and tasty appetizers that also make a fun after-school activity for the kiddos. They require just five ingredients and taste great with a side of marinara or pizza sauce for dipping. Add some extra veggies for a more nutritious snack or mix up the add-ins to suit your taste.